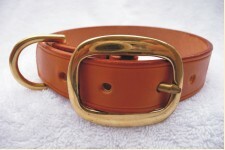 Handmade Belts use traditional techniques to make individual dog collars from the finest English bridle leathers. In addition to the wide range of styles shown on our website we will happily quote on commissions for other items. 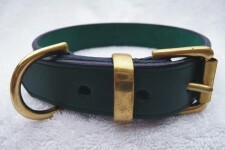 We offer dog collars in a range of widths and lengths to your precise requirements. 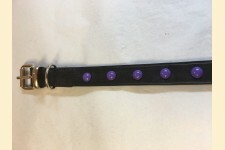 No machines are used in our workshops, each dog collar is hand made and finished to the highest standard using double hand stitching and English bridle leather. 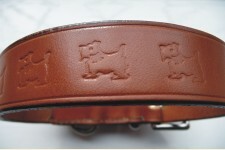 Each collar is made and personalised to each customer. 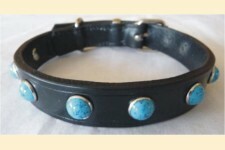 No stock is held of ready made collars. 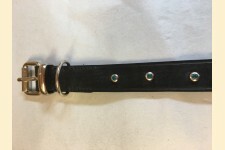 A robust collar hand crafted f..
A hand rolled and stitched col..
A Short handle lead, available..
An attractive collar with a 'b..
Silver hearts for your much lo..
A smart solid brass buckle and..
An attractive studded collar, ..
A substantial collar with a We..